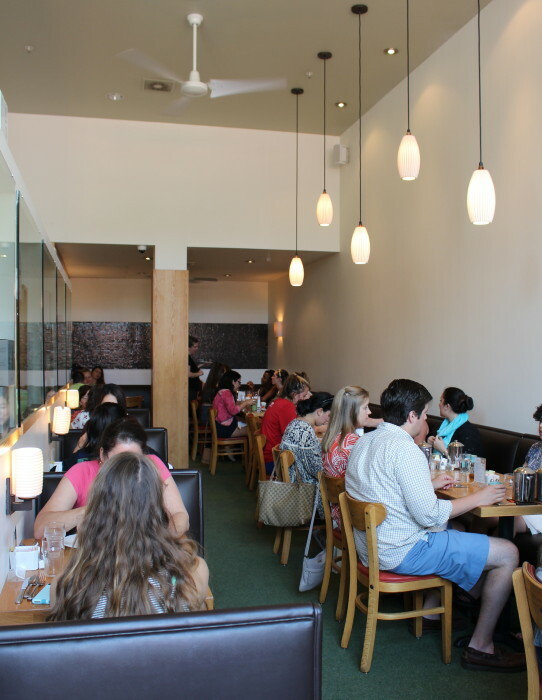 Austin is known for its hipness and The Steeping Room was in keeping with the vibrant aura surrounding Austin. There are two locations. 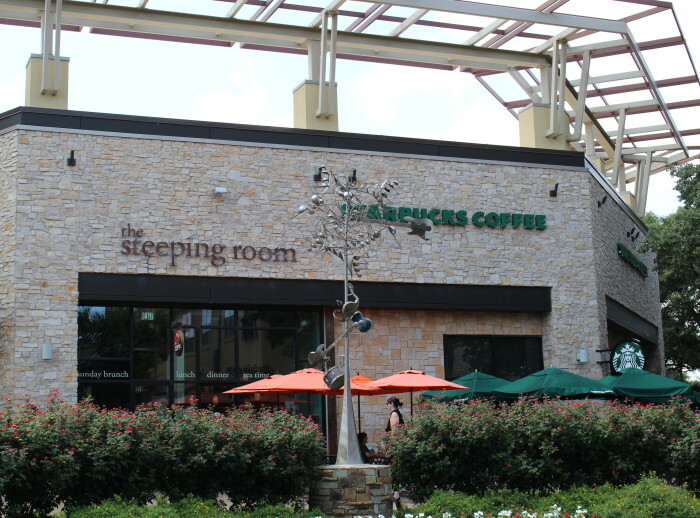 We visited the one in the Domain, a high-end outdoor shopping center in northwest Austin. You are greeted by this mural over the cash register as you walk in the front door. I like the way they think! They have a wall of tea if you want to purchase some to go. Here is their restaurant area. It is small and packed. I called more than a week in advance to book reservations and they only had a few times available. Apparently, it is a very popular place! They did manage to take us but limited our group to only eight people. Keep that in mind if you go and call well in advance to get your preferred seating time. They have a very extensive seven-page long tea menu. These folks are serious about their tea! They have black, green, and white teas. Assam, oolongs, nilgiri, matcha, sencha, pu-erh, tisanes, chai, and rooibos. 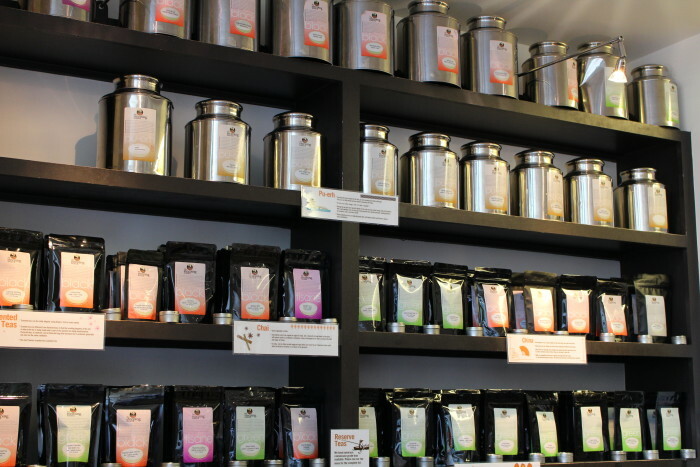 Teas from India, Nepal, China, Japan, Taiwan, Kenya, and Malawi. They have rare teas, reserve teas, and even tea with letters! (Click here if you’d like to learn more about the different grades of tea.) I was so in my element with fellow tea lovers! You could eat here every day for a month and never have the same tea twice. Heaven. 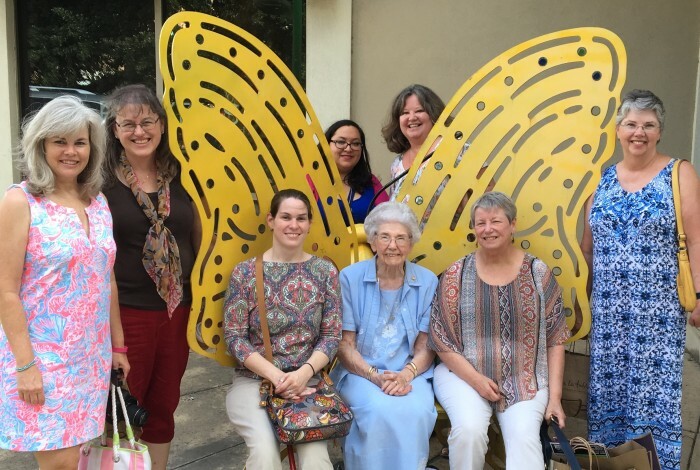 We went to Texas in July because that’s what everyone does, right? It was hot. Who knew? 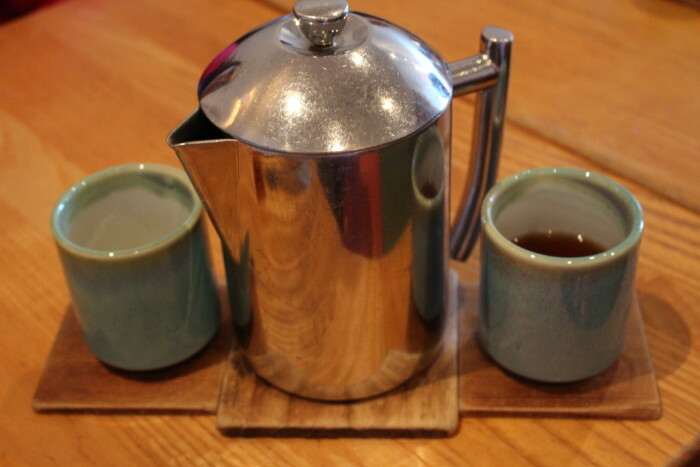 The tea was served piping hot in these stainless steel pots. I waited and waited for it to cool off but it never did. Too hot in the tea pot! I finally took the lid off and discovered it’s a double-walled thermal pot. No wonder! I left the lid off after that and it helped. Whew! 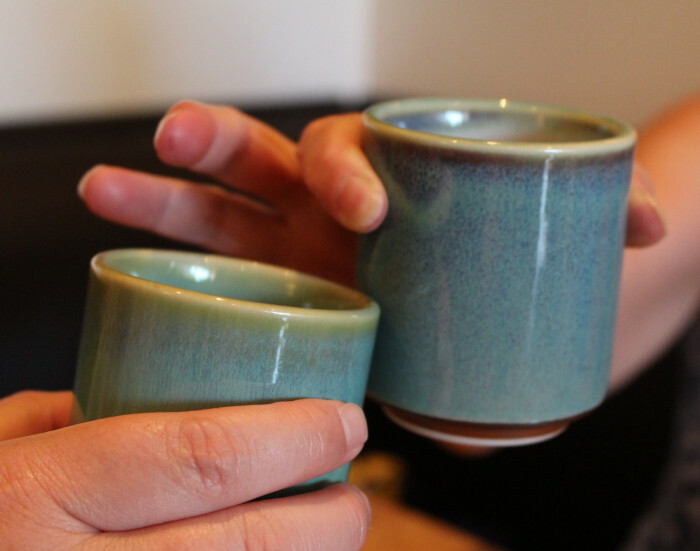 I thought the aqua-colored Asian style pottery tea cups were very boho chic. The simple, square wood coasters were a nice touch. We had five pots of tea to taste. The Pear Ginger tea had a surprisingly floral scent. It was lighter and naturally sweet. The Spiced Fig had a marvelous cinnamon, spicey scent. It was a lovely tea that should be smelled before tasting. It benefits from a little sweetener. It is a stronger tea and the fig flavor comes through in the taste. I think this one was our favorite! We had a nice, strong traditional English Breakfast that was everything it should be: strong, stout and black. It’s best with a little splash of cream. The Empress Floral was a very fragrant tea and the mildest tea of all was the Lemon Vanilla. All the teas were brewed properly. No bitterness. Truly a delight! 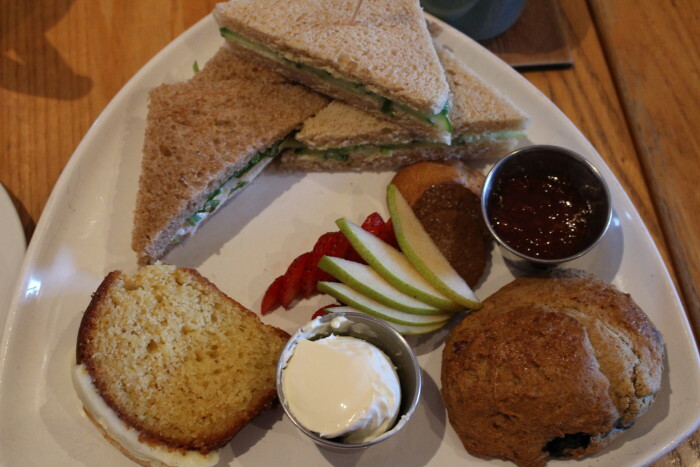 You can get sandwiches, salad, soups – your normal lunch offerings or choose from five different tea services. We ordered the Century Oaks Tea Service. You get your pick of two sandwiches, a scone, tea cake and cookies. As you can see below, the food was artfully presented. They definitely have creativity and skills in the kitchen. We had the Hen & Cress on spelt as a nod to my hometown. Huntsville was once known as the Watercress Capital. It was a nice variation on the usual chicken salad sandwich. The BAT – Bacon, Arugula, and Tomato on wheat was very good due to crispy bacon complemented by the basil mayonnaise. Surprisingly, one sandwich we’d order every time was the Lemon Edamame on wheat. The lemon and cucumber made for a very fresh sandwich. The spelt bread is denser than the wheat. The scones reminded me of muffin tops. They had quite a selection! There were seven scone options and 5 different spreads to choose from. The currant scone was slightly sweet, crumbly, and fresh and was perfect with clotted cream and strawberry jam. The mouthwatering tea cake was nice and moist. We first thought it was lemon and then figured out it was orange so the flavor was subtle enough to savor and ponder. The fresh fruit and variety of cookies were a nice bonus although at that point we were very full. It really is enough food to split with a friend. 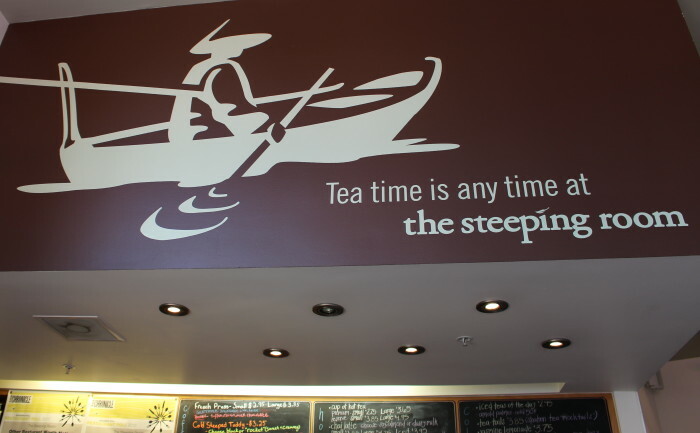 Overall, the Steeping Room is a modern tea room serving nouvelle cuisine. 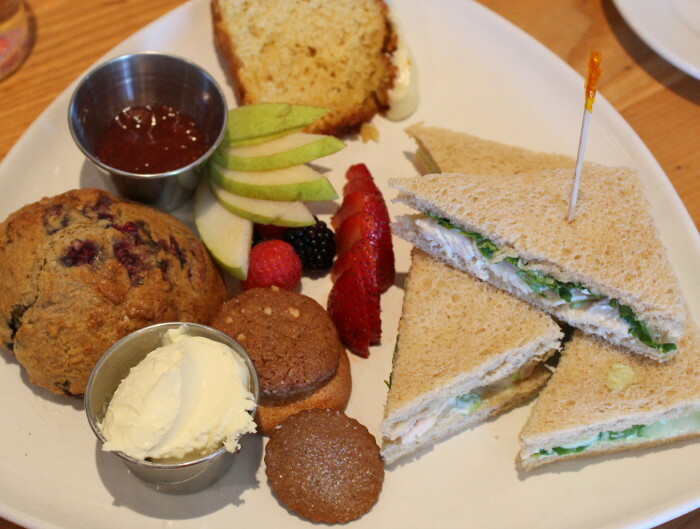 It’s the perfect place for tea lovers and foodies. After all, it is Austin. 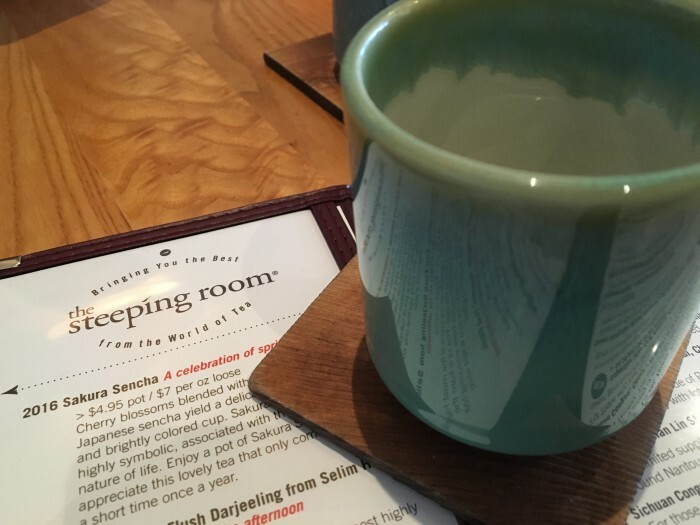 If you’re going to Austin stop in at The Steeping Room. I look forward to going again! It was such a happy time with family to visit and catch up over afternoon tea. We made special memories.